Free Shipping Included! 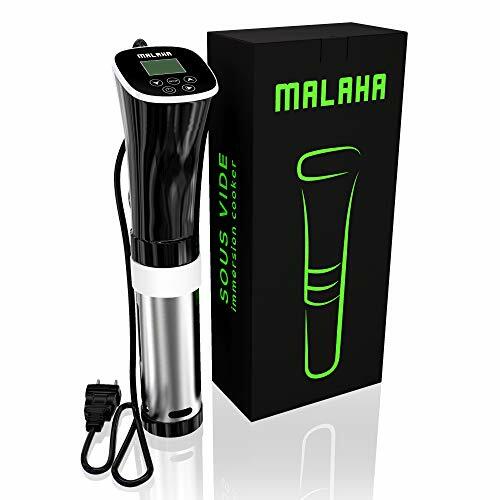 MALAHA Sous Vide Machine 1000W - Immersion Circulator - Professional Precision Cooker - Sous Vide Vacuum Heater - Accurate Temperature Digital Timer - Ultra Quiet Working Cooker by Malaha at Baking Love. Hurry! Limited time offer. Offer valid only while supplies last. 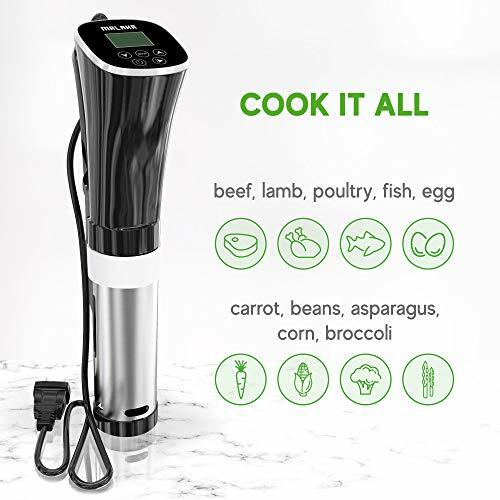 Sous Vide - Your Culinary Game Changer Sous vide is a method of cooking that makes it super simple to achieve professional-quality results at home. 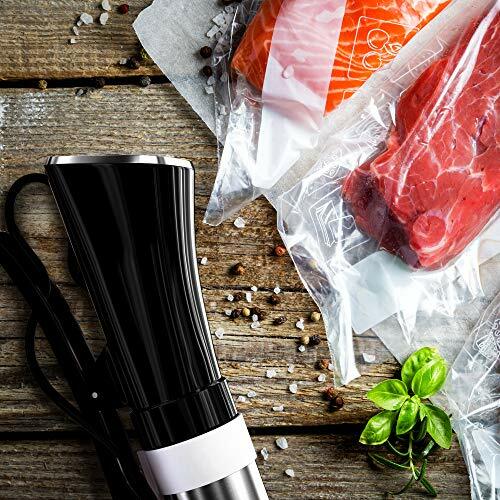 Changer Sous vide is a method of cooking that makes it super simple to achieve professional-quality results at home. The immersion circulator utilizes accurate time temperature control to deliver super-juicy, flavor-packed meals, every time. Professional chefs and restaurants started to rely on this immersion circulator since 10 years ago. Why Choose Our Sous Vide Cooker? 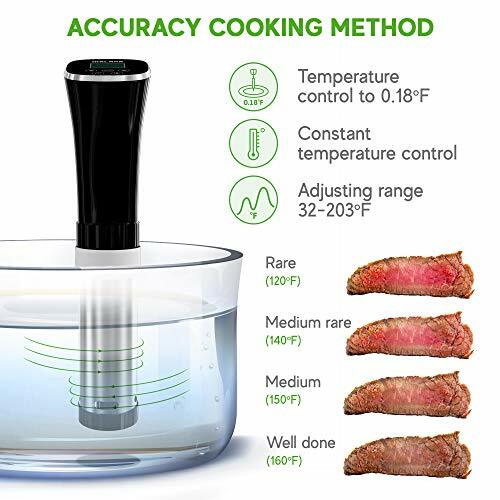 The ability of sous vide cooking to accurately control the temperature of the water, and hence the food being cooked in it, it slowly cooks your protein from edge to edge, you can avoid both the drying out and overcooking of the meat; and Seafood. Retain all the juices that provide flavor, this is why when you order steaks at a restaurant they are so moist, juicy and tender. Food that is cooked sous vide is pasteurized and safe from foodborne contaminants caused by biological pathogens. Sous vide cooking avoids the need for you to time things just right. You can focus on another task, no more undercooked, chewy or burnt food. 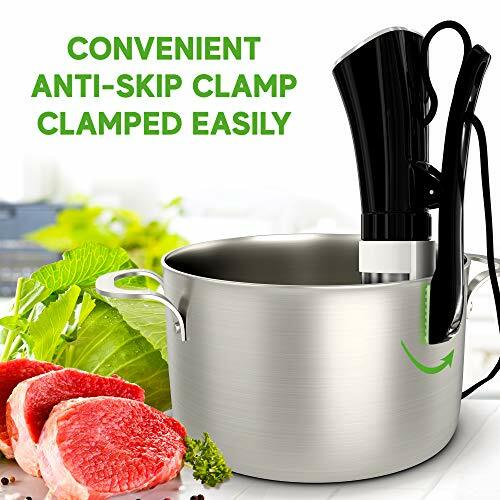 Great For The Multi­tasking Cook. Sous vide cooker allow you have a bigger window of time to play with if you are multi­tasking in the kitchen. Conventional cooking is much less forgiving. Traditionally prepared food dries out and results in waste. Food cooked via cooking, loses none of its volume. 1.Attach your sous vide cooker to a pot, set the time and temperature according to your desired level of doneness. 2.Put your food in a sealed bag and clip it to the side of the water pot. 3.Finish by searing, grilling, or broiling the food to add a crispy, golden exterior layer.Finish by searing, grilling, or broiling the food to add a crispy, golden exterior layer. Sou Vide Cooker Brings Professional Cooking Technology To Home: Michelin restaurant level quality, cook everything from Beef, Lamb, Poultry, Fish, Egg, Pasta, Chocolate, Baking, Salad, Dessert, Breakfast, Cocktail to Vegetarian. 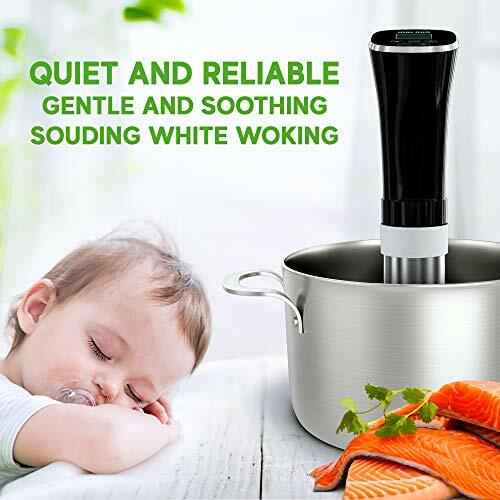 No fuss, no noise, no overcooking anymore, best deal to bring professional cooking to home. PERFECT DONENESS AND ACCURATE TIMER: Digital control panel makes the temperature accurate to 0.18°F and time to minutes. 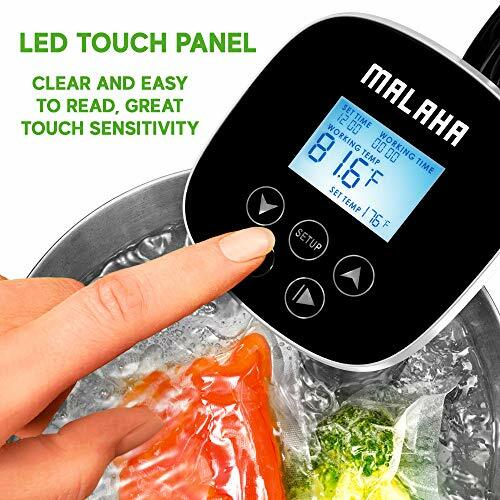 Wide range of temperature (32°F-203°F) and timecontrol (Max 99h 59mins) allows you to cook any type of food you like and Sous vide cooking retains more nutrients and vitamins than other cooking methods. INCREDIBLE EASY TO USE: Unlike other immersion circulators, those with WIFI and Bluetooth feature are thought as over-complicated and increase your cost. focus on the core functionality of the sous vide cooker itself. 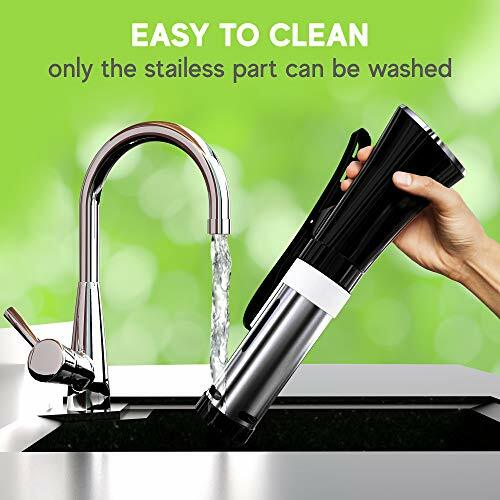 Stainless steel sleeve makes it extremely easy to clean and dry out. CLEVER DESIGN, SINGLE-HAND OPERATION: Attach sous vide cooker to any water-filled pot you already have, put your ingredients in a sealed bag or glass jar into the pot, set time and temperature, then press start with one hand to start the process; Our design prevents control panel from mist; Food grade stainless steel; Overheat and low water level protection mechanism. If you have any questions about this product by Malaha, contact us by completing and submitting the form below. If you are looking for a specif part number, please include it with your message.